On your list of haunted places in Oregon, you forgot about the Yaquina Baylighthouse which has quite a curious ghost story of its own. Located in Yaquina Bay State Park in Newport. In 1874, the crew of the whaling ship, Monkton, took over the ship and for reasons unknown, cast Captain Evan MacClure adrift in a small boat off the coastline. The captain was never seen again and the incident was reported as a homicide. The dead captain began appearing in homes and taverns along the coastline. Many people since that time have told the tale of seeing the red-haired captain with the face of a skeleton. One homeowner was told by the ghost that he was only "looking for a place to stay and someone to join him in death." 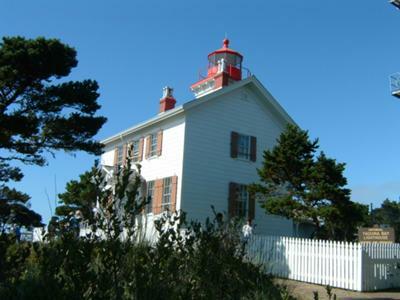 Captain MacClure found that place to stay in the Yaquina Bay Lighthouse, after it was abandoned in 1874. Not long after the ghost took up residence, it was reported that a young girl and her friends were picnicking there and she ran back into the lighthouse to retrieve a scarf she had forgotten. The friends heard her scream and dashed to the rescue, only to find the door locked. Despite efforts to find the young girl, she was never seen from again....at least not alive. The ghosts of Captain MacClure and a young lady in a flowing dress have been encountered by many people over the last 120 years.